In 1699, the King's Lynn parishes of St Margaret and All Saints formed an Incorporation under a local Act of Parliament. The Incorporation was managed by a Court of Guardians which had powers for the administration of poor relief in the town including the setting up of residential workhouses. 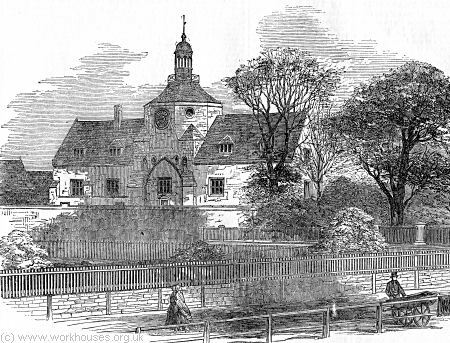 Shortly afterwards, St Margaret's parish set up a workhouse in a thirteenth century building which included the chapel of St James and was thus known as the St James' workhouse. It accommodated up to 170 inmates. A 40-bed infirmary was added in 1823. At Lynn the [workhouse] children were at church morning and afternoon; their singing delightful; they were decently and uniformly clothed, and properly fed (not farmed) by the parish; religiously educated, and, as far as my observations, well attended to. According to White's Directory of 1836, South Lynn All Saints parish had a workhouse which "is a large and ancient brick house, in Friar street, purchased by the overseers about seven years ago, but occupied for its present purpose more than sixty years. The number of paupers in the house is usually about thirty, clothed and fed at the cost of about 5s. 1d. per head per week. The poor rates, in 1835, amounted to £1328, collected in four rates, at 1s. 3d. in the pound on the assessed rental. Mr. J. Goodwin is master of the workhouse, and assistant overseer." In April 1824, All Saints parish promoted a local Act of parliament which allowed property owners, rather than occupiers, to be assessed for poor rates. The Act also provided for the erection of a new workhouse, although this appears not to have happened. King's Lynn Poor Law Union was formed on 30th September 1835. Its operation was overseen by an elected Board of Guardians, 21 in number, representing its constituent parishes of St Margaret's (18 Guardians), and South Lynn or All Saints (3 Guardians). The population falling within the Union at the 1831 census had been 13,370 with an average annual poor-rate expenditure for the period 1833-35 of £9,220 or 13s.10d. per head. The new union continued to use the St James' workhouse and in 1837, the Poor Law Commissioners approved an expenditure of £750 for additions and enlargements to the building which increased it capacity to around 200. The South Lynn workhouse was then sold off. THE KING'S LYNN UNION WORKHOUSE. This ancient building, which fell to the ground on the morning of Sunday, the 13th ult. (by which two lives were lost), was a structure of considerable archaeological interest, and was one of the most striking objects in the town of King's Lynn — but its central and most prominent portion is reduced to a heap of rubbish. The edifice was formerly a church (or rather chapel of ease to St. Margaret's church), built in or about the thirteenth century, and dedicated to St. James. In 1544, according to the Corporation records, its ritual plate was sold to raise funds for "repairing the walls of this town against the rage of the sea." In 1538 it was ordered to be taken down "from the steeple downwards." In 1550 four of its bells were sold for purchase of artillery for the defence of King's Lynn ; and, in the same year, it was again ordered to be taken down — the lead, timber, and stone to be in use for the Corporation, "provided that the timber work of the quire be reserved and covered again with tiles at their charge." In 1568 it was agreed that the Duke of Norfolk his Grace shall have twenty loads of freestone from the chapel of St. James, gratis." In 1582 the chapel was converted into a workhouse ; and considerable sums of money were fruitlessly spent in employing the poor therein upon the manufacture of baize. In 1597, the plague being prevalent, the chapel was converted into an hospital. In 1645 it became a pest-house. In 1682 it was fitted up by subscription as an hospital for "fifty decayed old men, women, and children." In the twelfth year of William III. it was assigned to the guardians of the poor of St. Margaret's, for the parish workhouse ; and, on the passing of the New Poor-law Act, it became the workhouse of the King's Lynn Union. The several orders which were made for its destruction appear to have been only partially carried out; and, until the recent catastrophe, there remained erect the greater part of the central tower (square at its base, but octagonal towards the summit), which was originally placed at the junction of the nave and transepts of the church. The lanthorn by which it was formerly surmounted had, however, been replaced by a cupola, round which was an external gallery, affording a very interesting prospect of the town and surrounding country. The cupola was at an elevation of about eighty feet from the ground, and contained a bell which chimed the hours, and was connected with a clock below, the face of which was illuminated at night. On the north and south sides of the tower were wings (about twenty feet lower), occupying the site of the old transepts, but built probably about two centuries since. There were other additions of more modern buildings in the front and rear. The front of the building had several immense buttresses of solid stone. Their strength, however, and the support they afforded, proves to have been more apparent than real. It is not known how long back apprehensions existed as to the safety of the tower. It is not improbable that, when the other portions of St. James's Church were pulled down, the strength of the tower was materially impaired. As many as thirty years ago a settlement was observed, and it was then recommended that this portion of the Workhouse should be rebuilt. No steps, however, were taken to carry this into effect, and the tower therefore remained, a source of continued and increasing danger ; and the wonder is, now that all the circumstances are known, not that it fell so suddenly, but that it stood so long. According to another account "large cracks appeared in the 80ft clock tower, and with cracking sounds coming from the walls and floors, the workhouse inmates fled outside. At 10.45 a.m. the workhouse clock stopped, a local clockmaker Mr. Andrew climbed the tower to repair it. At 11.20 a.m. with a tremendous crash the workhouse tower collapsed killing the clockmaker and an inmate who had refused to get out of bed." A replacement workhouse for 468 inmates was erected at Extons Road. It was designed by James Medland and Alfred Maberly who were also responsible for the 1859 Norwich workhouse. The first stone was laid on 16th July 1855, and the building work — carried out by local builder Charles Bennett — was completed on 24th June 1856. The total cost was £13,545. The building had a T-shaped plan. The front block had a three-storey central administration section, with two-storey accommodation wings. The axial block at the rear included a dining hall with a chapel above. A small infirmary lay to the rear. A vagrants and receiving ward was added in 1882 at a cost of £1,250. In 1901, an additional block was erected at the west of the original infirmary and linked to it by a walkway. The workhouse location and layout are shown on the 1904 map below. King's Lynn main block from south-east, 2001. King's Lynn entrance from the south, 2001. King's Lynn from the north-west, 2001. The Workhouse contains 206 inmates, but it is built to receive 468. The sexes are nearly equally divided. Gas is introduced into every room, and good ventilation is secured by openings in the ceilings which lead to the turrets of the building. There is a school containing forty-six boys and forty-six girls, and an excellent infirmary. There are two other features in this house to which I must refer:— 1. The chapel is one of the most beautiful I have ever entered in any building, much less in a workhouse. 2. A Turkish bath has been erected in the house, and proves of great service both to the sick and the healthy. The introduction of the hot air bath supplies a practical hint for workhouse management everywhere, and one which the medical officers of those institutions should bear in mind. Mr. Kendall, the Medical Officer to the Lynn Workhouse, has the merit of first introducing the hot air bath for the benefit of the poor in the manner described. 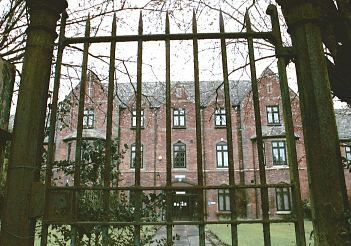 The workhouse later became St James' Hospital which closed in 1985. The surviving part of the main block is now used as offices for the area Health Authority. Norfolk Record Office, The Archive Centre, Martineau Lane, Norwich NR1 2DQ. St James' Parish Workhouse (various records from 1737 onwards including several series naming inmates); Admission/discharge registers etc. (1780-1951 with gaps); Outdoor poor lists (1736-1843, 1870); Records of South Lynn paupers (1826-40); Board of Guardians' minute books (1804-1930, with gaps); Creed registers (1870-82, 1890-1901); Deaths (1923-43); etc.